Links of websites you might have a look on ! Here you will find only Links to websites and to websites of dealers I know in person ! These pages are dedicated to the men of the German Panzertruppe who fought honorably and bravely, gave their lives in numerous battles and operations in World War II; from Finland to North Africa and from Spain to the extreme corner of the former Soviet Union. Their sacrifices, privations and selfless devotion to their comrades are a shining example; their deaths a lasting Memorial! 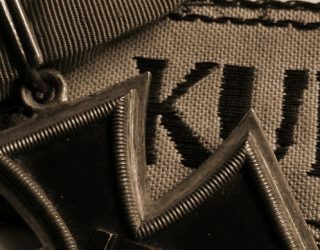 A Dealer website where you can always stop by and check the new items once a week.High quality badges and medals, all sorts of daggers, uniforms and paper grouping form World War I and World War II. Experienced personal and always good prices make this dealer to one of the first addresses to look for something you might need in your collection. You can always stop by in the store located in the town of Lübeck to get a personal impression of the professional work they do. The Website of Militaria Berlin belongs to Christian von Eicke who is a trust full salesman with a very good reputation in the field of combat awards and German military medals. He has always nice and rare badges in his shop for an affordable price with exact description and good photo material. Always open for questions if it goes in the specifications and details of badges and their history. Another really good address here in Germany to buy badges and medals from. The website Militaria-Archiv Carsten Baldes e.K. is always a place to go. Every Friday Mr. Baldes offers a large variety of Badges and Medals from 1813 – 1945. Good quality and fair prices are the major points you find here. A long time in military business and a huge knowledge in the field of World War I aviation badges make Mr. Baldes to a sought contact person. Helmut Weitze is one of the oldest and bigest military dealer company arround the world. With a huge variety of different medals, badges, uniforms, paperwork, daggers and more he has what your are looking for in stock. Always very correct like a Hamburg salesman has to be, he knows almost every collector arround the world. THE place in Hamburg to stop buy and get the missing link for your collection.